Unit Plan Sizes: 403-1,223 sq. ft.
Kapolei Lofts, a visionary, sustainable and affordable housing community is filling the need for quality, reasonably priced housing in West Oahu. The community is a four block series of three-story walk-up apartment buildings and serves as a gateway to the Southern end of Palailai Mall. Each of the 14 buildings create a strong corner presence, and along with the clubhouse & future retail component, promote a pedestrian friendly, mixed-use, walkable community with entry stoops connecting ground floor terraces directly to the sidewalk along the street. The 499 units from 403 to 1,223 square feet are offered based on affordability. In all, 100 units are set aside for renters who earn 80% of the area median income, 200 units for those who earn 140 percent of the area median income while the remaining 199 units are offered at market rate. 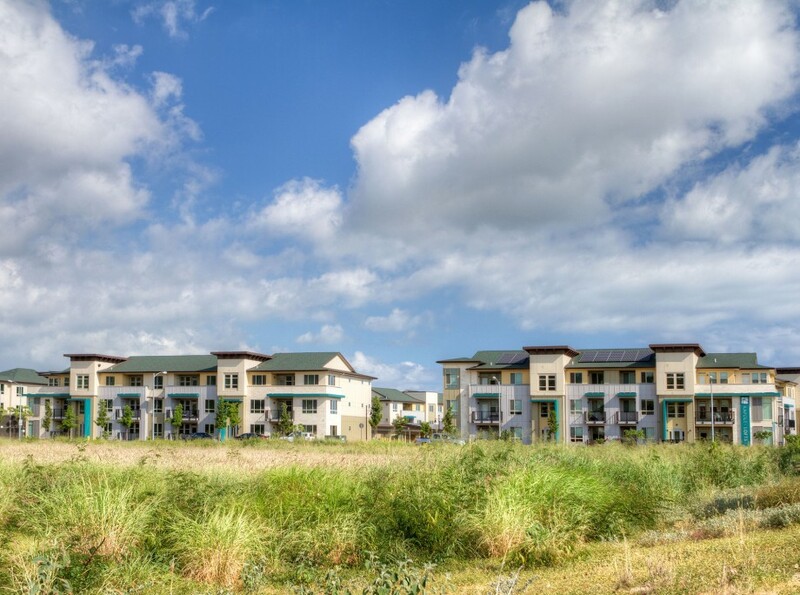 Kapolei Lofts are sustainable and feature efficient design and construction. This development elevates, enhances and enriches the community by providing quality housing that works with the local climate to generate and store energy, reducing the cost of living for residents while being conveniently located near shops, public transportation and the local high school. Structural: Enayat Schneider Engineering, Inc. Mechanical, Electrical & Plumbing: Given & Associates Inc.